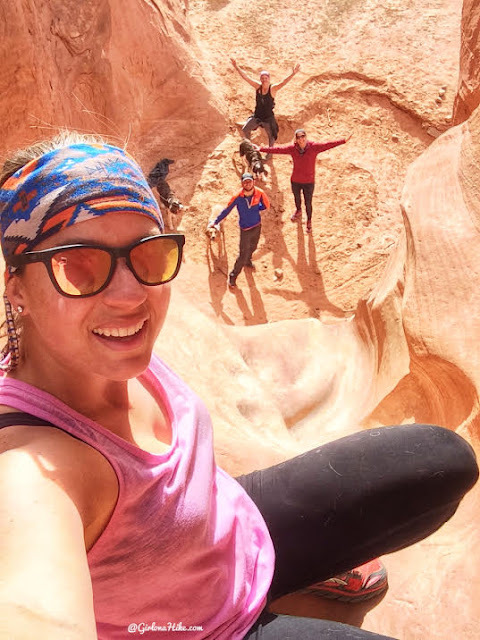 Peekaboo slot canyon is shorter and shallow compared to Spooky, but still offers views of amazing twisting and turning canyon walls. It's best to do these canyons as a loop hike, rather than hike up and back, then up and back the other. 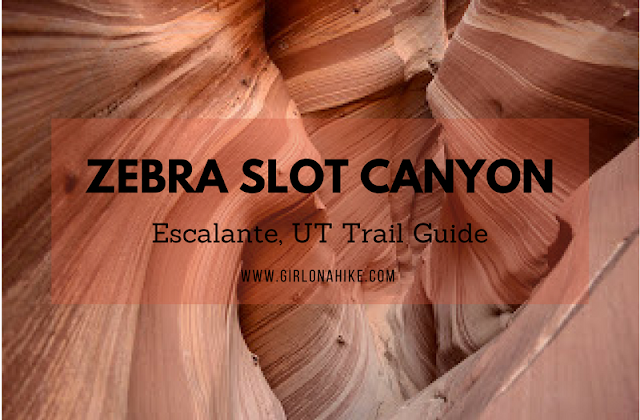 The best route, in my opinion, is to hike up Spooky first, cross over, then drop down Peekaboo (clounterclockwise direction). The reason I say this is because it's easier to drop down a 15 ft dryfall rather than hike up it. The obstacles in Spooky are much easier to manuever by hiking up as well. 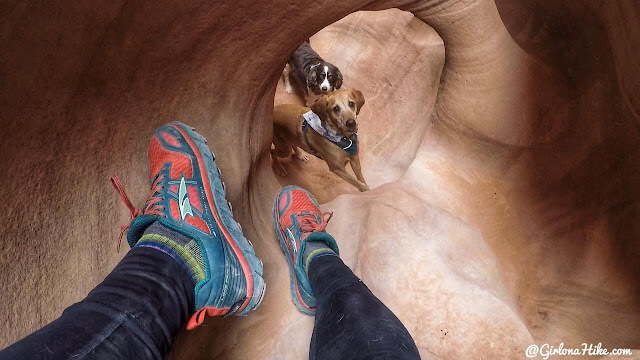 If it's rained recently, you will find pools of water in both canyons, but their floors are typically dry and sandy. If there's even a slight chance of rain, stay away. 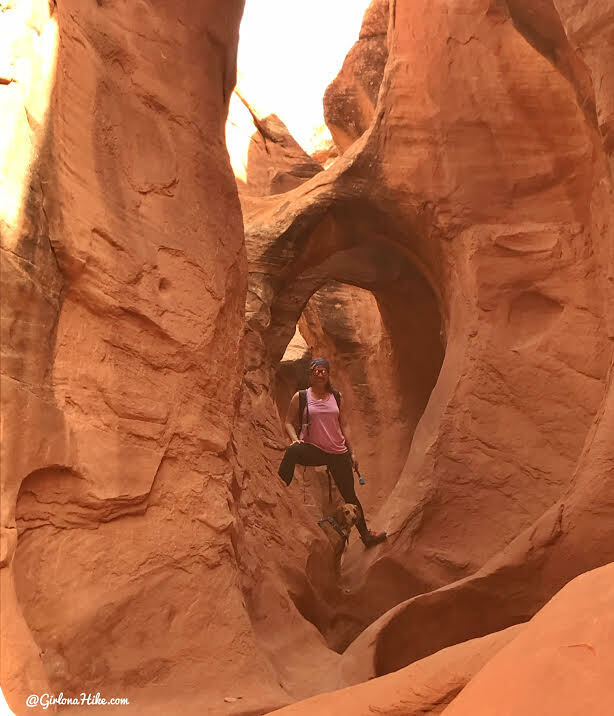 Slot canyons can instantly become flashflood death zones. Both slots are brightest during mid-day, so if you are looking to do some photography start around 11am. The downside to this is that you may encounter many more hikers wanting to continue through. 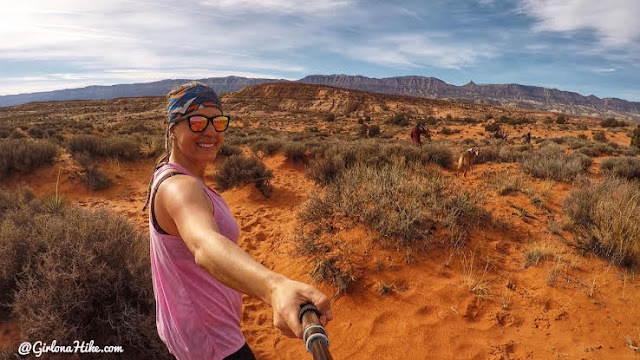 Start early to beat the heat and the other hikers. 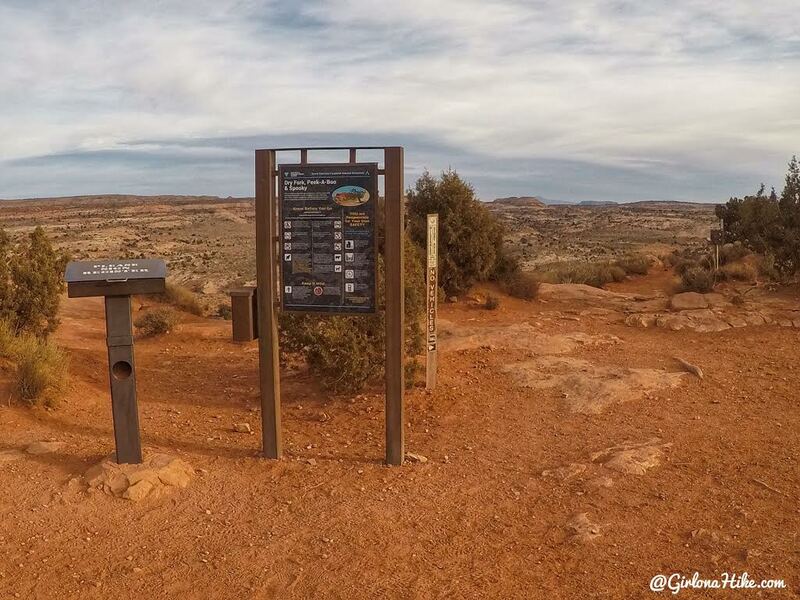 Here is a driving map From Escalante, UT. 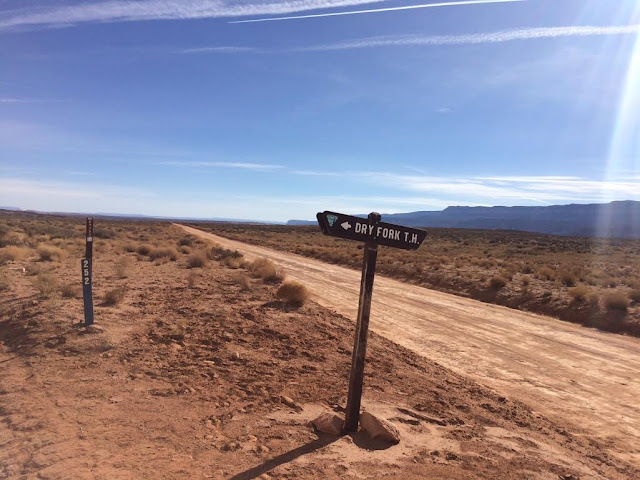 From Escalante, head East on HWY 12, then turn south for Hole in The Rock Rd (HITR). Reset your odometer and drive 26 miles down the well-graded dirt road. 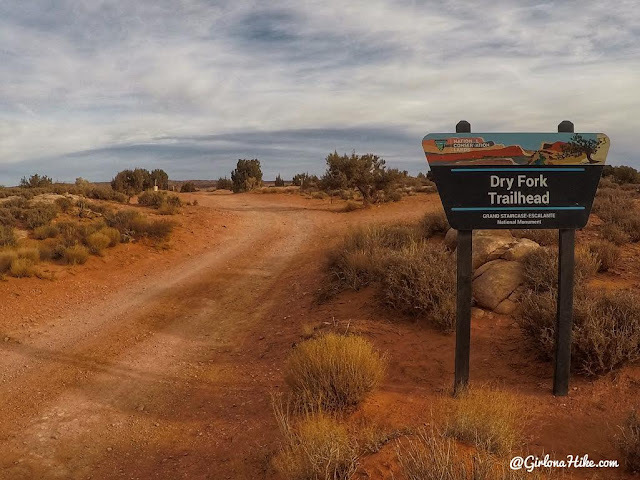 Turn left at the signed "Dry Fork TH" (also Co Rd 252), then drive 1.7 miles to the end of the road. This road can be very rutted out, so if needed, you can park at the first parking lot about 1/2 mile on that same turn off, then walk the rest of the way to the TH. Can I bring my dog here? Though dogs are allowed off leash, and we brought ours along, I wouldn't recommend taking dogs here. Spooky slot canyon is very narrow, only 12 inches at its widest. There are also several obstacles they need assistance with - the hardest being a 5 ft scramble up to another boulder hop. 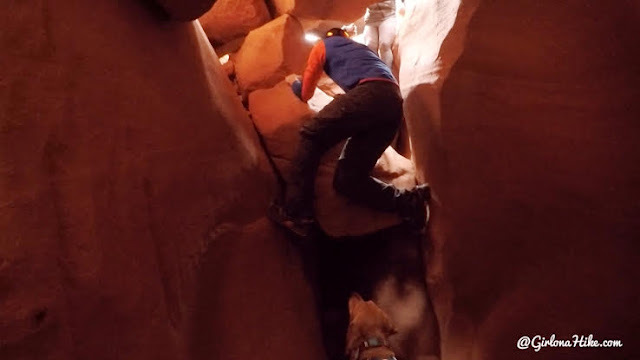 Then on the way down out from PeekaBoo slot canyon, they need help getting down a 15 ft dryfall. 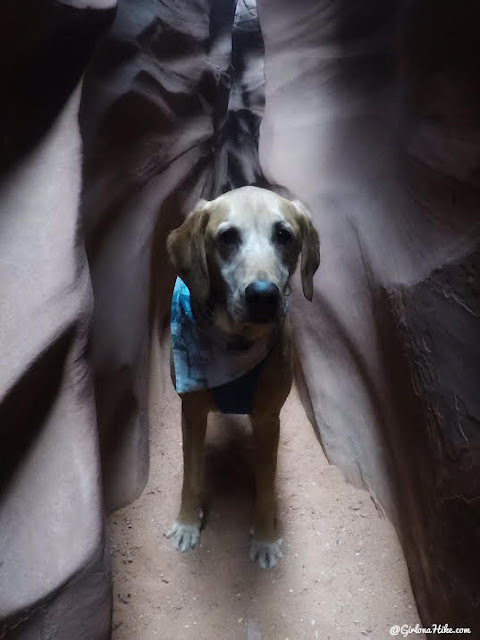 Dogs over 70-75 pounds will definitely not fit through the Spooky Slot Canyon. 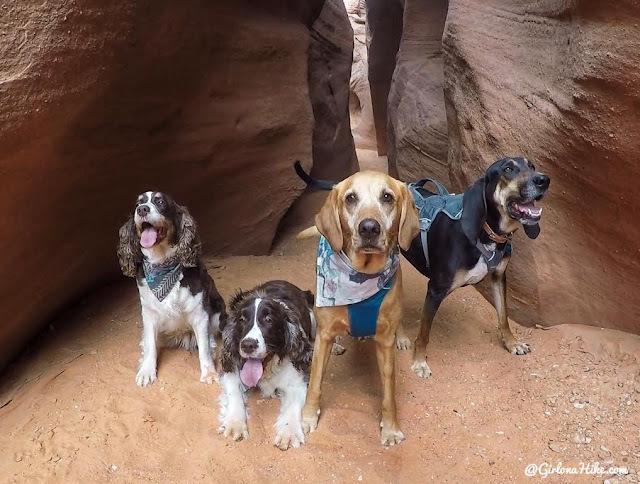 If you still want to bring your dog, make sure they wear a dog harness to help pull them over obstacles and to lower them down the 15 ft drop. 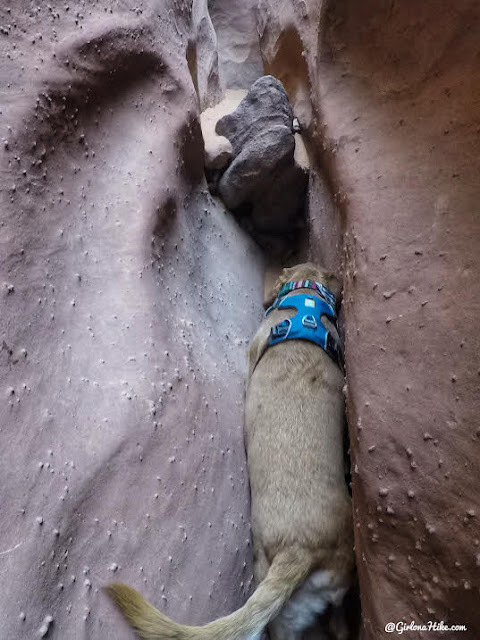 You don't need ropes persay, but definitely 2-3 other people helping you and your dog out. 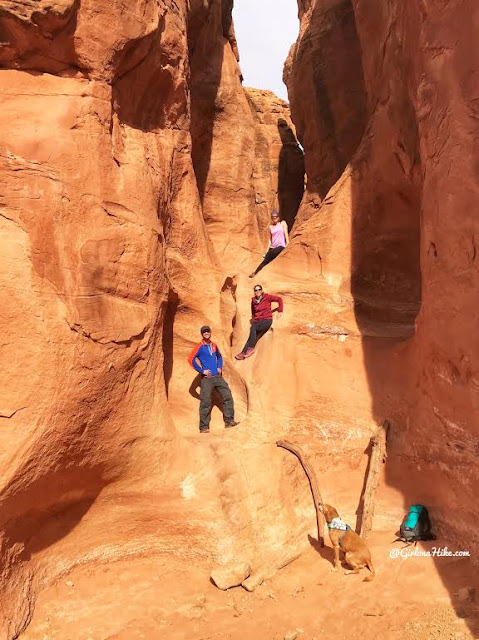 Kids who are comfortable with tight spaces and scrambling will have fun and do well. They will need help up the 5 ft scramble, and getting down the 15 ft dryfall. 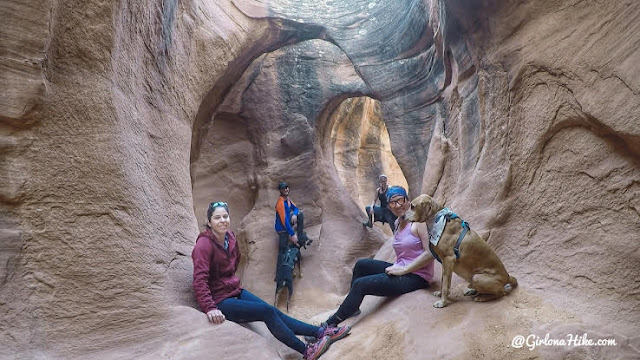 Another option for both dogs and kids is to only hike into the canyon where you feel comfortable, then turn around. 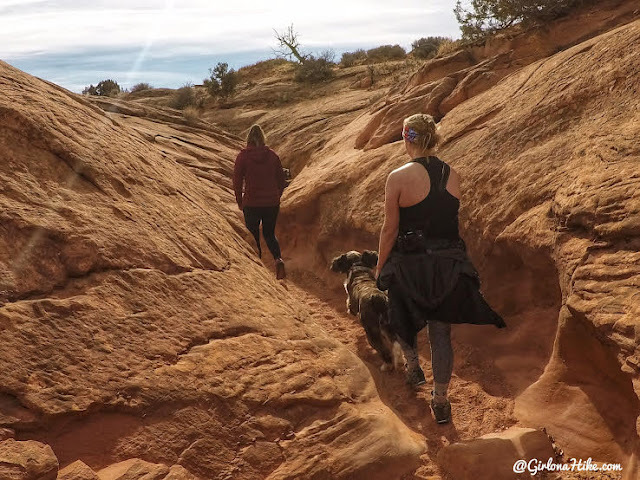 However, if you go during high tourist season (March-October), there will be few options for turning around where you won't run into others trying to hike up the slot. 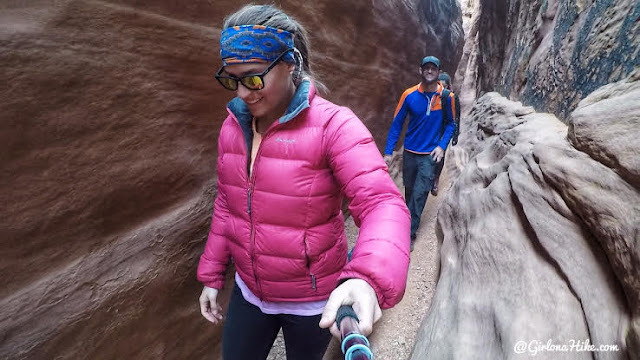 Only bring one backpack per group of hikers - Spooky Canyon is too narrow to fit you and your backpack. There were 4 of us in our group plus the dogs, and we were able to share a pack with all of our snacks and 3 liters of water. The hike is only 4.5 miles RT so you don't need a ton of gear. 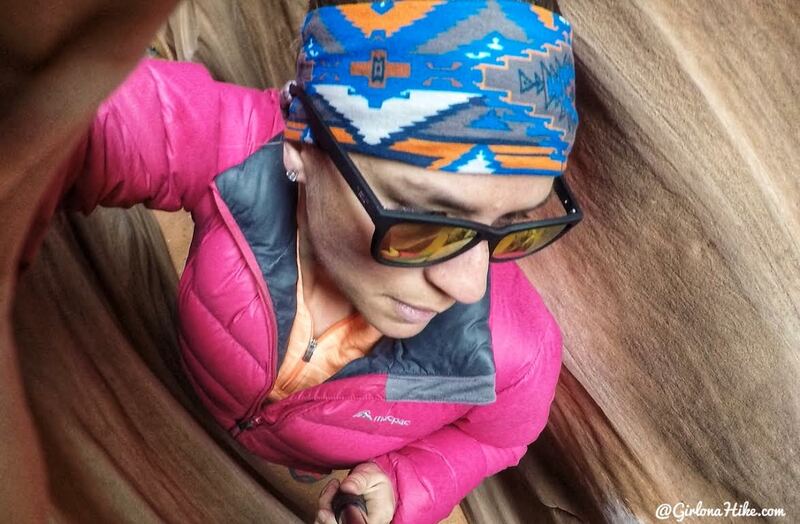 The simpler & lighter you go, the easier it will be getting through the canyon. 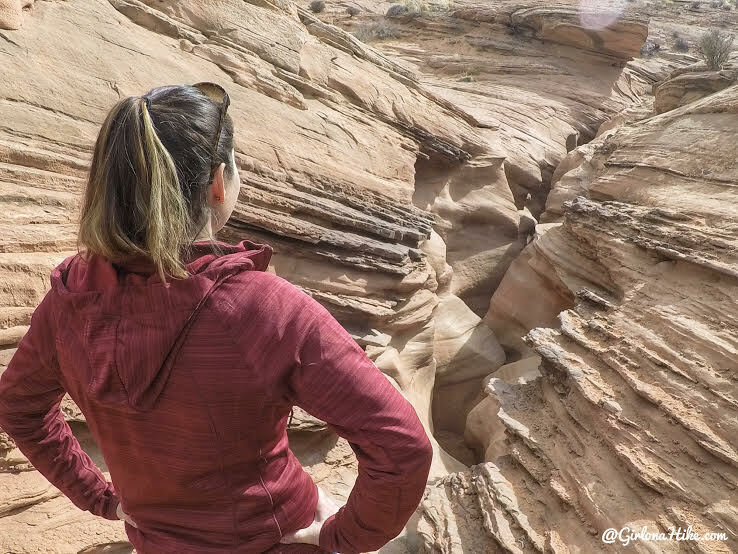 Also don't wear your "nice" hiking clothes - the canyon walls will scrape your clothes and they can get torn. Dress in layers - even in January we were down to tank tops when popped out of the canyon into the sun. As you apporach the TH and parking area, you'll see this nice new sign. The trail starts in the NE corner of the lot. 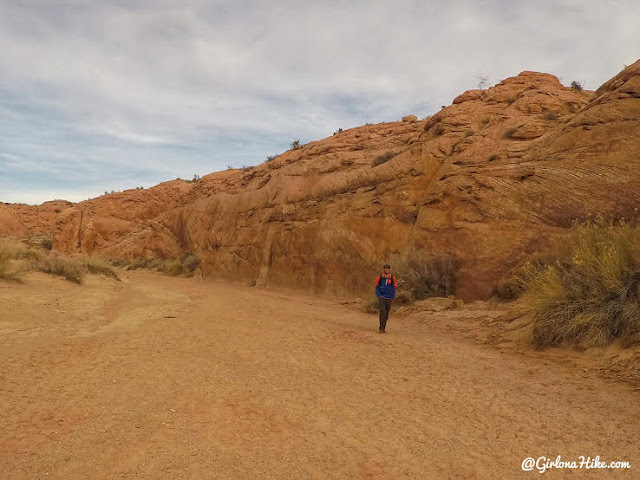 Follow the large cairns to get to the base of Dry Fork Canyon. You'll hike through sand and slickrock, as you keep descending. 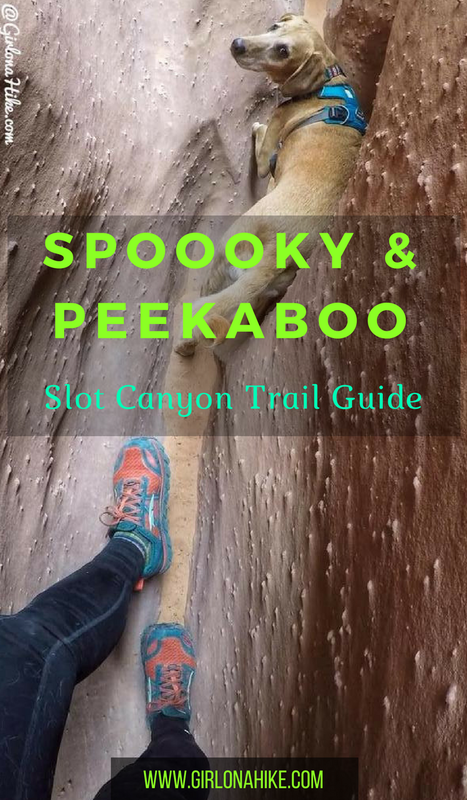 Once in the canyon, pass the entrance to Peekaboo on your left, then continuing following the trail to the entrance of Spooky. 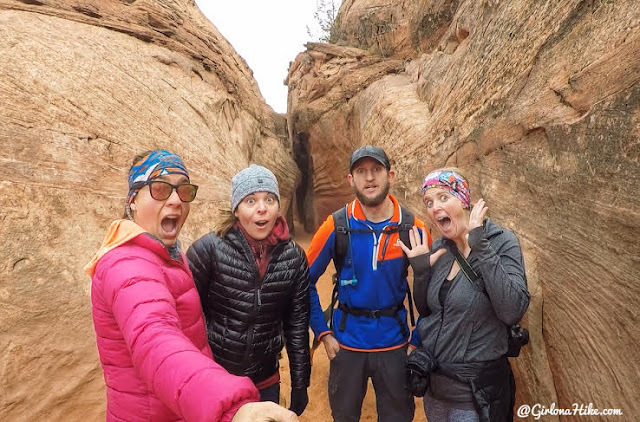 Our "spooked" faces as we enter Spooky Slot Canyon! Making our way into the canyon! Charlie leads us into the darkness. And now you can see how tight the canyon is! Charlie is 70 lbs and barely scrapes through. Getting tighter! See all those little bumps on the canyon walls? They will tear your clothes easily. 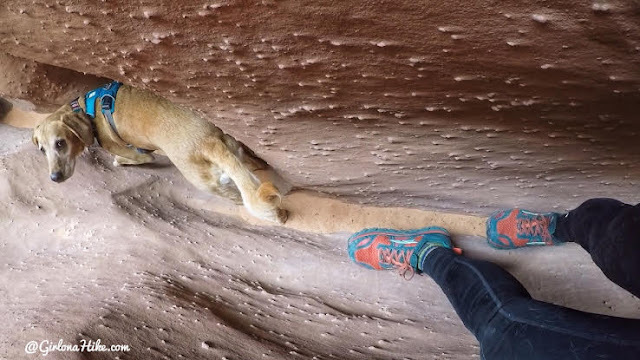 Sometimes the canyon is even too narrow for feet to fit comfortably. A rare sighting of Charlie smiling! He loves slot canyons. 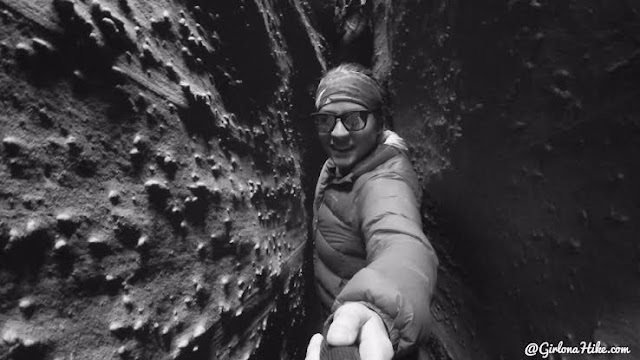 Towards the end of Spooky, you'll reach the 5 ft scramble. You have to kind of chimney your feet up - the boulder where he is gripping has two really good hand holds to pull up. 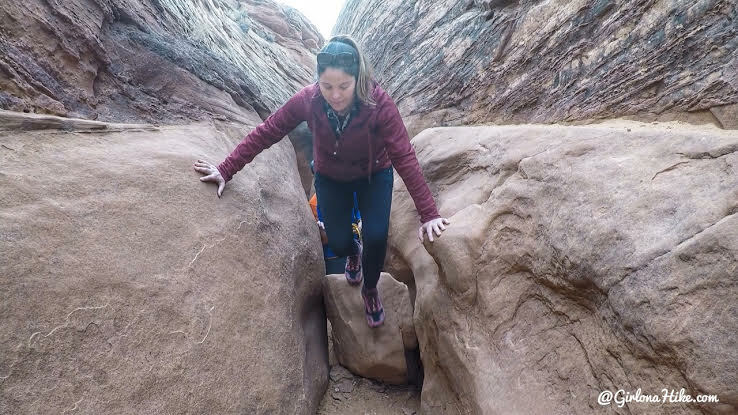 Make your way over some really small boulders, and then you'll exit Spooky. 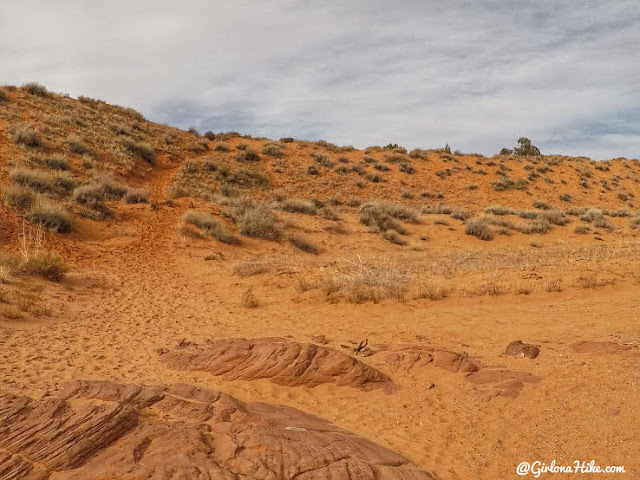 As soon as you get out of Spooky, look for the trail to the left. This is your trail to loop over to Peekaboo. Loving this tank top weather in January! PS I'm loving my new shades from Nectar - check them out on Amazon! Keep following the cairns as it leads you to the East side of Peekaboo. Follow the slot canyon to the west as you enter Peekaboo. @Ihaveathingfordogs scopes out our route. Watch out dogs, Mama is coming down! 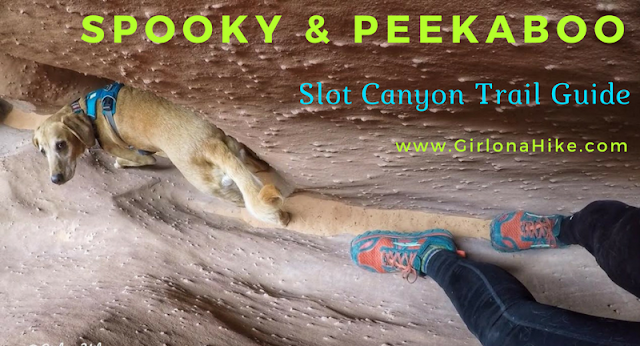 Finally the canyon opens again, and you now have the iconic view of Peekaboo slot canyon. Start to drop down, as you make your way to the exit. The exit for Peekaboo (you should have passed this on your way to Spooky when you started the hike). This is about a 15 ft dryfall - the hardest part for helping the dogs get out of the canyon. Same spot in Peekaboo, but my point of view! Overall the dogs did great, but it was stressful at times. There's no way I could have helped Charlie over the obstacles by myself. It really helped to have a harness and 3 other people to help me get him up and over tough spots. 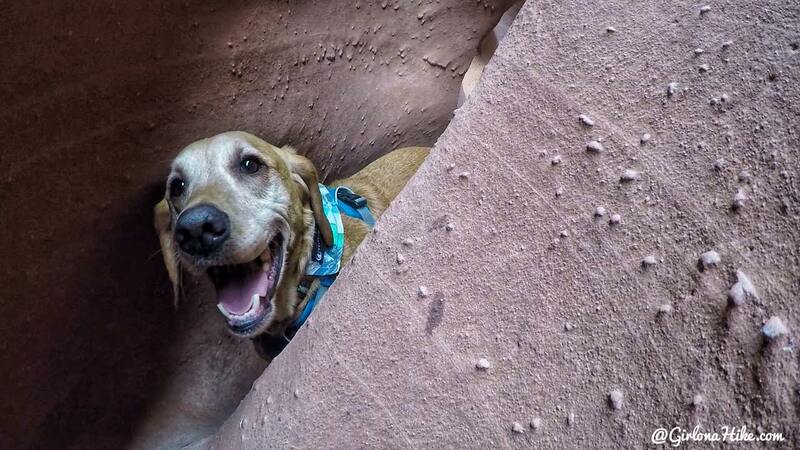 Copper was the hardest to help, since we weighs the most at about 80 lbs and has the largest girth. He also tore a nail and split his dew claw (poor guy!). You can see my GPS went a little crazy in the slots, but it shows the general direction. You can also cut over to Spooky faster by skipping the rounded section, and following the brown post sign that has a "P" on it. 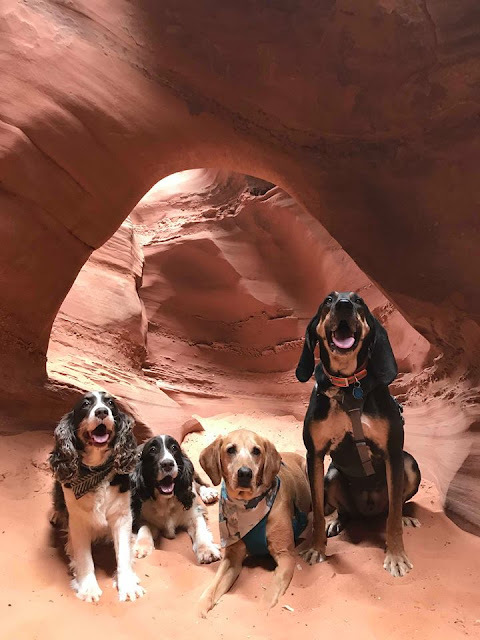 Great hike! 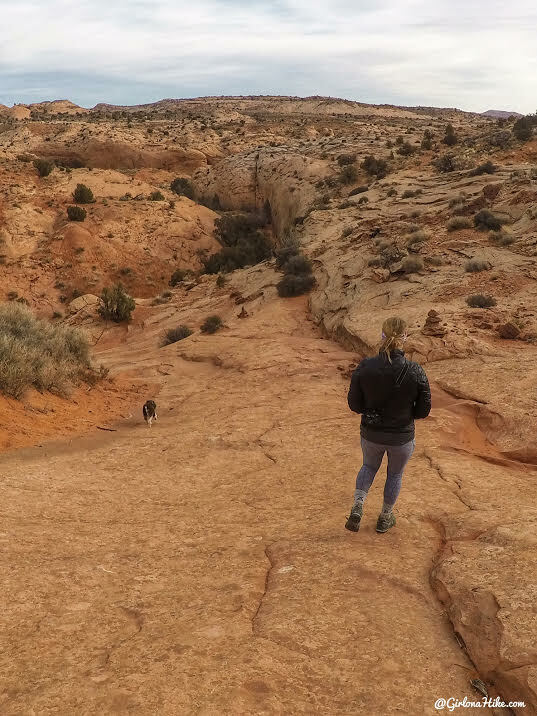 I really liked hiking in a loop. Definitely make sure your dog is up for it, if there is any question in your mind don’t bring them! I was surpised that spooky was my favorite, I was the most excited for Peek-a-boo, but Spooky was my favorite for sure! Hi, I read online that they don't allow dogs at the Peekaboo ? 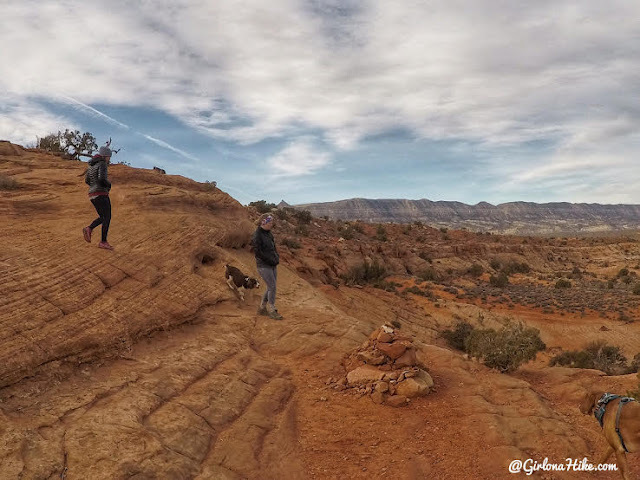 I was planning on bringing my dog to this trail, but the hotel people said they are not allowed. Any help or suggestions ? Thank you for sharing. Am heading there from Australia in March and you've given me much useful information. Love the shot of the three dogs trying to get up in the other section.